Greyhawk has been talking to his television again... specifically, addressing Rep. John Murtha on his recent 60 Minutes appearance. It's a first-rate Fisking. 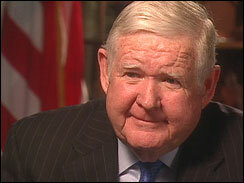 Murtha contradicts himself several times during the interview with Mike Wallace ("Our troops have become the primary target of the insurgency"; "the US troops are now caught in the middle of an Iraqi civil war"); along the way, he also paints a very bleak picture of American troop morale, while ignoring reenlistment rates. Greyhawk is on top of it all; check it out. Ostensibly I am receiving this portfolio for the transition period of a number of months until the elections, but as mentioned we cannot permit ourselves to view this period as one of transition or to rest until Israel's elections. First of all, in the Middle East there is never a dull moment. Imagine to yourselves where we were a month or two months ago and where we'll be in another week or ten days. There was a window of opportunity following the disengagement process that Israel created, and a choice should have been set before the Palestinians. We should have told them that this is the meaning of democracy and you should choose it, not go to the polls with weapons, and not come armed to parliament, and not go armed to the government. But the Palestinians came with a different claim to the international community and said that they need these elections in order to provide legitimacy in the war against the terrorist organizations. So our objective now, even though the PA elections were supposed to complete the process of dismantling terrorism [...] our commitment today is to make it clear at home, but particularly to the international community, that this process has not been resolved and the Palestinians have not been released from their commitment to dismantle the terrorist organizations. Both Palestinian terrorism and European antisemitism are hard problems, and it's easy to understand why people prefer to postpone dealing with them. But history will not forgive them for doing so. Israeli military Chief of Staff Dan Halutz was recently asked how far Israel was willing to go to put a stop to Iran’s nuclear ambitions. I might add that he then refused to discuss the matter any further -- whether anyone would act, or if so, who or when.